If you own a business, you know that toner can be an aggravatingly costly and inconvenient expense that can cost twenty cents or more per page. Whether you’re a small or large business, you shouldn’t be forced to feel any anxiety over printing advertisements, meeting minutes, etc. because of the incredibly high price of OEM (Original Equipment Manufacturer) toner cartridges. 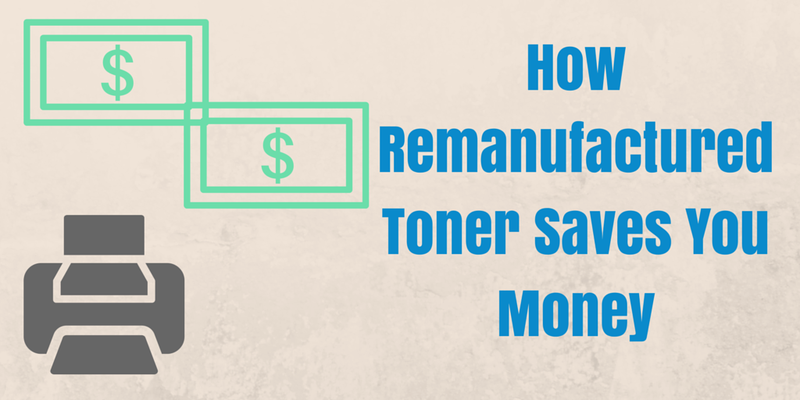 Before understanding what remanufactured toner is, it’s important to be aware that many of the alternatives offered don’t live up to the quality of OEM cartridges. Many cheap alternatives to OEM toner cartridges are just that, cheap. For example, some companies offer refilled cartridges. They simply drill a hole in the side of the toner hopper and then fill it with toner and sale it to customers. While this certainly saves money, it will come at the expense of poor print quality and lower yielding cartridges because refilling the toner only doesn’t address the used drum, wiper blade or other components of the cartridge. High quality remanufactured toner cartridges give you the quality and yield of the OEM’s without having to pay the high OEM prices. But what exactly does “remanufactured” mean? The process of creating a high quality remanufactured cartridge starts with using the OEM core and then adding a new drum, wiper blade, OEM Chip (So you’ll be able to run all reports from the menu and your printer will recognize the cartridges as genuine) and then using Ultrasonic Welding to reseal the core (So you don’t have the leaking of toner in machines that plague many of the cheaper remanufactured cartridges). By replacing these parts for new ones, you will be able to have a toner cartridge that will operate just as effectively and consistently as original cartridges, but at a fraction of the manufacturer’s price. Finding where you can reduce costs is an essential part of running a business. Purchasing remanufactured toner instead of OEM cartridges is a smart and effective option regardless of the size of your business. Caltronics Business Systems can get your business the high quality toner you need with out the high cost. This entry was posted in Uncategorized on April 29, 2015 by riehlt.